Here’s a fun school alphabet strip ribbon and bow you can create for back to school craft projects and teacher gifts. 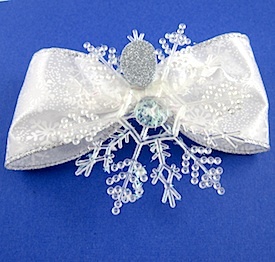 The ribbon can be made long enough to wrap around a package or wreath, or made into an easy bow to attach to the front. The bow would be perfect for some of the school themed wreaths and projects that are so popular. 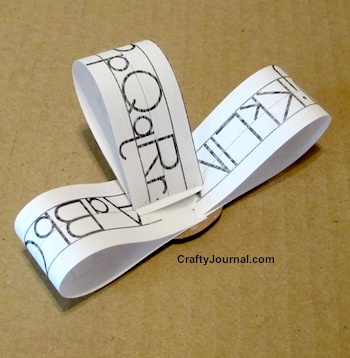 How to Make a School Alphabet Strip Ribbon and Bow. 1. First you need to find a schoolhouse font in a word processing program. In my Mac computer Pages program it is called Schoolhouse Printed. Your software may have another name for it. And you can also look for the font online if you don’t have it. 2. To print, you need to use the landscape mode (paper turned sideways) so your lines of alphabet will be longer. 3. Type the alphabet: Aa Bb Cc with a space between each PAIR of letters. Use a 64 point font for this size ribbon, and once you’ve typed the whole alphabet, just copy and paste the alphabet until you have filled the page. 4. Print a page or two more than you think you’ll need. I printed 4 pages, but used just slightly more than 1 page for this bow. 5. Cut the lines of alphabet apart so that they look like this. When you cut, be sure to include that 1/4 inch of white space above the top row and below the bottom row. 6. 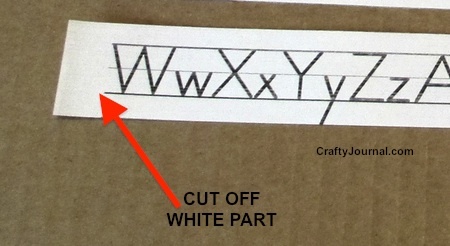 Lay the first 2 strips of alphabet end to end. Cut off the extra white area in front of the letters on the left strip. 7. Lay the left strip over the right strip and match the lines on both strips. Try to leave the same spacing between the letters as there is all along the strips. 8. 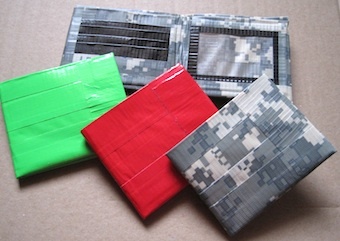 Use a small piece of invisible tape to adhere the strips. Turn the strip over and tape the edge on the back side, as well. Continue adding strips (in alphabetical order) until you’ve used them all. Wrap the finished ribbon around an empty ribbon reel or a paper towel tube. 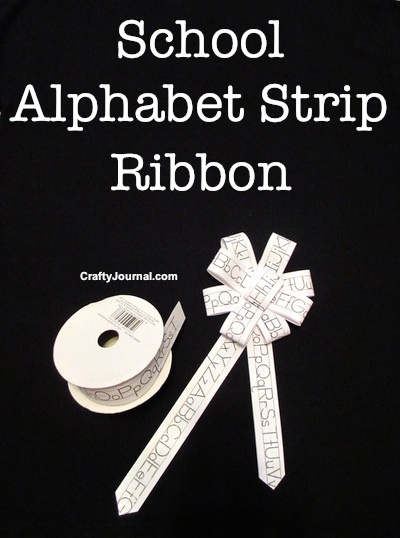 How to Make the Alphabet Strip Ribbon Bow. 1. Don’t tape the strips together to make this bow. 2. 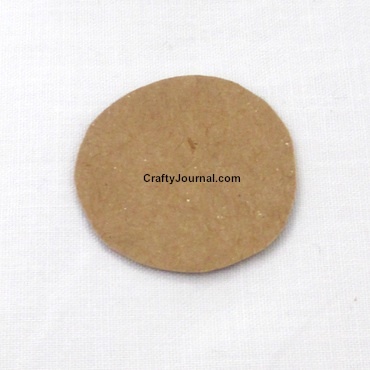 Cut a cardboard circle that is about 1 1/4 inch in diameter. 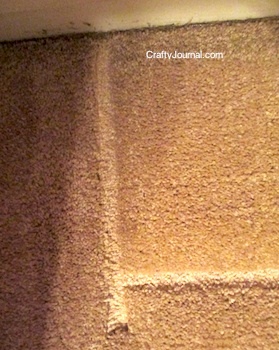 I used cereal box cardboard. 3. Cut 4 alphabet strips exactly in half. 4. Curve the first strip so the ends almost meet – having the shorter end on top, so the tape will hold both ends. Put the loop on the circle with the ends slightly overlapping the center of the circle. Tape the ends to the circle. 5. Make a second loop and tape it directly across from the first circle, with the ends slightly overlapping the ends of the first loop. 6. Attach a third loop to the circle at right angles to the first pair of loops, slightly overlapping center. Continue adding loops, with each pair straight across from each other, until you have attached all the loops. 7. Using a stapler, staple through all the loops and the cardboard. You may need more than 1 staple. 8. Cut one more strip in half, and use one half to make a circle. Tape the circle closed. 9. Use a bit of hot glue to attach the circle to the center of the loops. 10. To make ribbon ends, cut 2 more strips and make one a little shorter than the other. On one end of each strip, cut the end to a point. 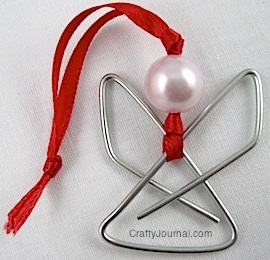 To finish the bow, attach the strips to the back of the bow, letting the points hang down. This is a great tutorial. I love everything about it and the bow looks so perfect! Nice. Such a creative idea. I love it! Thanks for sharing with SYC. Very Creative idea!! It would be fun to try with the bowdabra. Thank you so much for sharing on our Saturday Bowdabra Crafty Showcase!!! What a crafty idea! This ribbon is too cute! Love the tutorial. I absolutely love this tutorial! 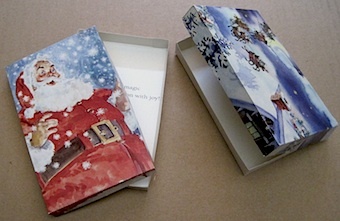 The pictures are so helpful and the finished product is adorable! Now my mind is spinning with all other ideas for this technique – thanks for sharing!